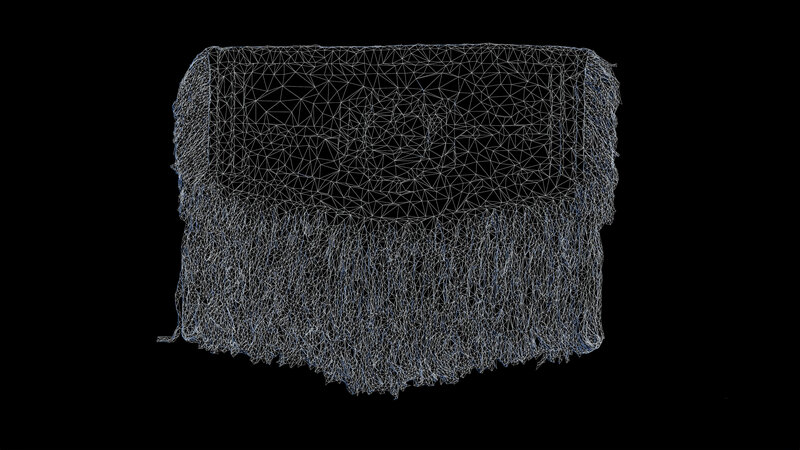 In summer of 2018 Kate Hennessy and Hannah Turner collaborated with artist and weaver Meghann O’Brien and digital artist Conrad Sly to produce a new media work titled Wrapped in the Cloud. This media installation is a part of the traveling exhibition Boarder X, curated by Jaimie Issac. Boarder X has just opened at the Art Gallery of Alberta in Edmonton. The new digital work made it possible for the original Sky Blanket to be returned home while its representation continued to travel in the exhibition. Boarder X takes place from January 26 – May 19, 2019 at the Art Gallery of Alberta. “Boarder X brings together interdisciplinary contemporary art from artists of Indigenous nations across Canada who surf, skate, and snowboard. In this exhibition these practices are vehicles to challenge conformity and status quo, as well as demonstrate knowledge and performed relationships with the land. Reading the urban terrain, making a cement jungle a playground, riding the natural contours of the white immovable mountains, or shredding the ever-changing waves: these are responses to the land. It is not about controlling land and water, but being humbled by their power. Beyond claiming space, the artwork recognizes human existence in relation to vast geographies and how we’ve thrived in those spaces. Surfing has a long history of Indigenous ways of being, originating from pre-contact Polynesian cultures. Skateboarding and snowboarding emerged in the 1960s and 80s respectively, which for a time were popular in subcultures resisting the mainstream. Boarder X celebrates the intersection of culture, art, and boarding practices. Its representation is interdisciplinary, consisting of painting, mixed media, carving, weaving, photography, performance, and video to reflect cultural, political, environmental, and social perspectives and critiques in relation to the territories we occupy. Boarder X has been organized and circulated by the Winnipeg Art Gallery, curated by Jaimie Isaac.